The local Swifts briefly stayed in formation last night – managed to count 22 high over the church! 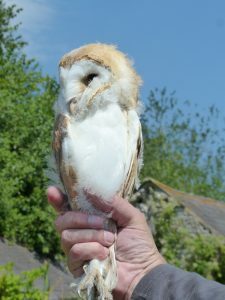 Tuesday a ringer with the appropriate schedule 1 licence, myself and a member of the Woodland Flora & Fauna Group were out ringing Barn Owls in their boxes around the Sayers Common/Albourne area. Persuaded the others to come across to look at the Henfield Birdwatch owl box, in which we found 5 healthy chicks, 3 males, 2 females. One had already been out and about – its feet were clean because it had been scuffling around in the grass.